Lyudmila Pavlichenko is considered the deadliest woman sniper of the WWII. During the Great Patriotic War, hundreds of thousands of Soviet women fought at the front against Nazi Germany on equal terms with men. Some of them were snipers whose phenomenal results helped swing the course of the war. 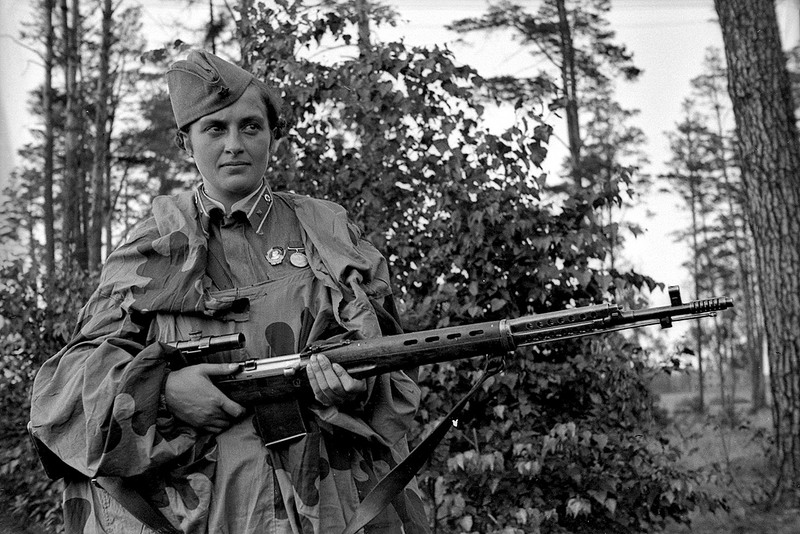 RBTH presents the stories of the three most famous Soviet women snipers from the war years. Lyudmila Pavlichenko is considered the deadliest woman sniper of the Great Patriotic War, with 309 kills to her name, all of them enemy soldiers and officers. Nicknamed “Lady Death” by foreign war reporters, she is the subject of songs and movies. In the Soviet Union, her image twice appeared on postage stamps. Pavlichenko volunteered for frontline service at the age of 25, and joined the combat army after only brief sniper training. Pavlichenko was involved in the defense of Sevastopol practically till the very end. Under the most horrendous conditions, the city stood firm for eight months. In June 1942 Pavlichenko was wounded and evacuated from the city. In less than one year, Pavlichenko eliminated 300 enemy soldiers and officers. It is said that some of Germany’s top snipers were sent to take her out, 36 of whom she neutralized. One of her adversaries, according to media reports, was a German sniper with over 400 kills. Having recovered from injury, Pavlichenko traveled to the United States and Canada as part of a Soviet youth delegation. She was received by U.S. President Franklin Roosevelt, and his wife Eleanor took her on a trip around the country. At meetings in the United States, Pavlichenko urged the Allies to expedite the opening of a second front in Europe. Speaking in Chicago, she stated: “Gentlemen, I am 25 years old. I have already annihilated 309 fascist invaders. Do you not think, gentlemen, that you have been hiding behind my back for too long?” In the United States she was presented with a Colt pistol, and in Canada with a Winchester rifle. The singer Woody Guthrie dedicated the song “Miss Pavlichenko” to her. In 1943 Pavlichenko was awarded the title Hero of the Soviet Union, but she did not return to the front and spent her time training snipers. Born in Kazakhstan, Aliya Moldagulova was in Leningrad when war broke out. In March 1942, the 16-year-old girl was evacuated from the besieged city, along with other children from the orphanage where she lived. By December of that same year, Aliya had enrolled as a cadet at the recently established Central School of Sniper Training Instructors. There she was awarded a personalized rifle for fine marksmanship, and in July of the following year, Aliya was sent to the front. “In August 1943 sniper Aliya Moldagulova joined our brigade. A fragile, very likeable girl from Kazakhstan. Despite only being 18 years old, by October she had 32 fascist kills to her name,” recalls one of Aliya’s fellow women soldiers. The latter also recounts that Aliya was exceptionally brave. Besides being an excellent sniper, she also captured German soldiers and carried the wounded from the battlefield, administering first aid in the process. Aliya was killed during the liberation of the Pskov Region in north-west Russia in January 1944. As told by eyewitnesses, she repeatedly led her fellow fighters on the attack with the cry: “Brothers, soldiers, follow me!” During one such attack, despite being injured by shrapnel, she charged at the enemy. Wounded once more by a German officer, she nevertheless managed to kill her adversary. Aliya later died from wounds sustained during this battle. Roza Shanina was a kindergarten teacher. She saw frontline action at the age of 19 after two years of badgering the military enlistment office to send her to the front. In June 1943, like Aliya Moldagulova, she enrolled at the Central School of Sniper Training Instructors, graduating with honors. Fellow soldiers recall that on killing her first Nazi in April 1944, she exclaimed: “I killed a person, a person...” However, just a few days later she had ten enemy kills to her name, and in a month's time she was awarded the Order of Glory Third Class. Her trademark technique was the “doublet”—a double shot in one breath. Roza was soon presented with another Order of Glory, this time Second Class. As the first woman to receive this award, it brought her nationwide fame. The frontline newspaper Let’s Destroy the Enemy wrote about her, and the Moscow magazine Ogonyok put her photo on its cover. Foreign journalists dubbed her “the Invisible Horror of East Prussia,” which is where she served from the fall of 1944 onwards. In her wartime diary, Roza wrote that she did not deserve all this glory. She believed that she had contributed very little to the war effort. Having served for nine months, she was killed in action in January 1945, just three months before victory, while covering the wounded commander of her artillery unit. She is believed to have eliminated 59 Wehrmacht soldiers and officers.